Gebr. Lödige Maschinenbau GmbH is presenting the CoriMix® continuous ring layer mixer at POWTECH 2017. The basis of the robust system is the high circumferential speed of the mixing unit, which forces the product into a concentric ring layer. The process demonstrates its true strengths wherever liquids have to be distributed very efficiently at high to very high throughput rates. The use of ring layer mixers is also interesting in many industries in terms of cost-effectiveness and versatility. 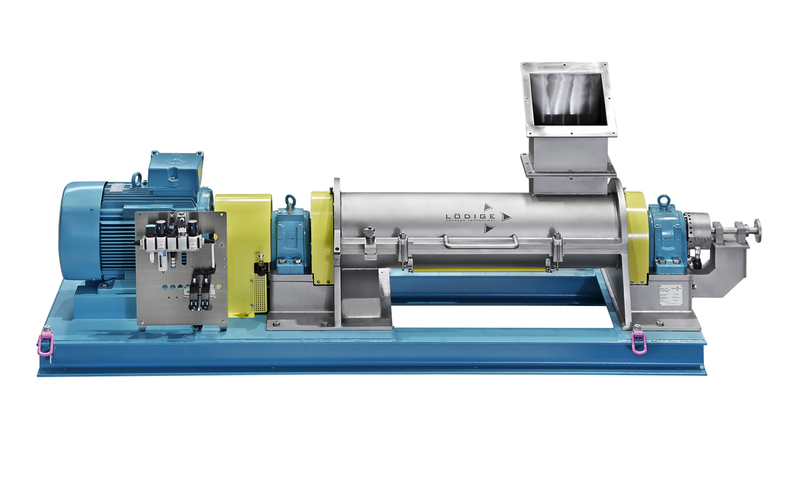 The mixing unit of a ring layer system rotates with circumferential speeds of up to 40 m/s. As a result, the product components are accelerated through centrifugal force. This causes a ring layer to be formed. Within this concentric layer there are enormous differences in speed between the rapidly rotating mixing tools and the stationary container wall. As a consequence: friction is particularly high in the ring layer profile. The specially shaped tools of the mixing unit move the product during the subsequent process in a pattern similar to plug flow through the mixing chamber. Because this happens very rapidly, the residence times are very short and the residence time deviation is narrow. The CoriMix® high-performance ring layer mixer can be used for the cost-effective implementation of a variety of processes. As a pioneer of this mixing system, Lödige offers the high-performance CoriMix® (CM) ring layer mixer in a variety of sizes as both laboratory and production mixers. Depending on the product, throughput of up to 0.50 m³/h in a laboratory setting and up to 500 m³/h in production can be achieved, with an effective volume of between 5 and 3,000 liters. The consistently compact design enables high performance densities to be obtained. The individual application-specific design of each individual machine means that a wide variety of processes can be implemented cost effectively using the CoriMix®. The spectrum ranges from mixing, wetting, compaction and granulation to dispersion, gluing, agglomeration, dissolving and melting. The CoriMix® is thus the perfect choice for the production of moist mixtures and suspensions, as well as for coating primary particles and for producing fine agglomerates of small particle sizes within a narrow granularity range. The CoriMix® can easily be connected to a continuous KM Ploughshare® mixer in order to produce a dry mix with many components and the highest mixing quality. Likewise, products can be post-processed in a KM to further optimize the product properties after liquid is added. When materials are added externally, they are introduced by means of feed pipes, which are installed in the drum wall and which project into the product layer. When materials are added internally, the liquid is guided through a rotary device via a hollow shaft to reach specially perforated tools and is thus feed directly into the mixing material ring. Both additive techniques avoid wetting the shaft and the mixer wall, preventing product adhesion. The system also allows the mixing chamber to be divided into zones of different shearing intensity. This makes it possible to adapt the process to varying product characteristics at any time. The mixing container is divided centrally along its entire length and can be opened out. This makes the mixing system easy to clean, maintain and, if necessary, adapt to new requirements. Optional linings for the mixing container also make it possible to process products with a tendency towards adhesion or abrasion. Special composites, wear-resistant alloys, as well as reinforcement ensure the appropriate protection against wear and tear. The largest possible heat exchange surface is assured by a double jacket on the mixing container. This can be used to control the machine temperature. Intensive product contact and exchange at the container wall also allow for highly efficient thermal transfer.